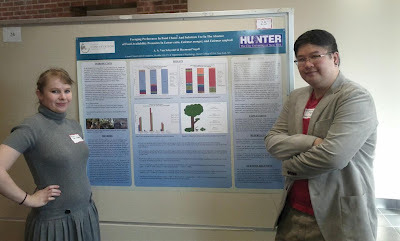 MPIG 2012: My First Poster Session! Last weekend was my first time going to the Midwest Primate Interest Group (MPIG). I thoroughly enjoyed the academic experience, not to mention being able to meet fellow primatologists and those whose work I have read frequently but never met in person. I was also able to meet some friends that I've met online through blogs, Facebook and Twitter in person. So, in short, MPIG was a great academic experience and also a way for me to put a 3D sensory input on people I knew but never met. The podium talks were great and posters were very interesting. I only wish the poster session was longer so I could see all the posters that were submitted (there were 25 and I was only able to see 5!). Getting ready to present our groundbreaking data! MPIG also marked my first time presenting an academic poster. I was the co-author, with the illustrious Ashlee Van Schyndel (from This Is Serious Monkey Business) as the first author. Thanks to those that stopped by to look at our poster, and gave us important and useful constructive criticisms (and praises!). I have included the poster on the bottom of this post. So, what do you guys think? Any suggestions on how we can make a better poster in the future? Foraging behaviors are complex and is contingent upon the environment in which the organism lives. In situations where the ecological pressure of food availability is removed, individuals have the option of foraging based on preference. At the Myakka City Lemur Reserve in Myakka City, Florida, lemurs are semi-captive, free ranging, and provisioned. 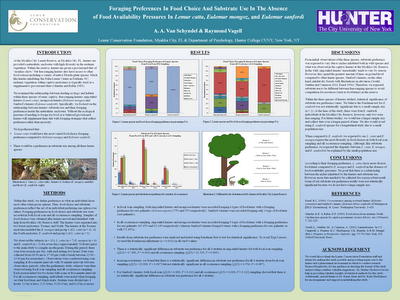 However, between the multiple lemur species in the free-ranging forests, there is an expected diversity in foraging preferences in terms of food choice and substrate use. For this study, three species of lemurs were studied: ring-tailed lemurs (Lemur catta), mongoose lemurs (Eulemur mongoz), and Sanford’s brown lemurs (Eulemur sanfordi). A focal animal scan sampling and all occurrences sampling was completed over the course of two months that measured activity budget, food item choice, and substrate use. Results indicate there is a relationship between the niches inhabited by the lemurs in terms of substrate use and food item choice.